Brainworks has recently announced a new expanded functionality to their Paywall module. The Day Pass will allow media companies the flexibility of charging for their content on a daily basis while also providing non-subscribers the opportunity to consume editorial when convenient for the reader. This important new functionality meets the needs of publishers that are looking to further develop value for their content and drive revenue to those audiences that may not be looking to subscribe to the print edition or monthly content. This new audience focused feature is in addition to Brainworks’ fully integrated paywall system and subscriber portal. Cindy Bates, Director of Circulation Operations at Brainworks shared, “We are excited that our clients now have options to maintain a 24×7 relationship with their customers. This allows their customers access content via any device at their convenience”. 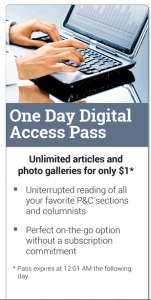 The Post and Courier, Charleston, SC is the initial development partner for this new technology and has gone live with the Day Pass. More information about this new offering to their readers can be found here.